Marjorie has been writing regularly since she was given a diary for her thirteenth birthday - although those entries were just for her. 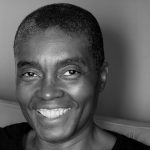 As a diarist and writer since childhood, Marjorie continued to write into adulthood and has had pieces published in local and national newspapers including The Guardian and a University student magazine. She has also been published as co-author of a book by the Northampton Black History Association called Sharing the Past. More recently Marjorie has also been published as part of two anthology collections of essays, short stories and poems.